Following on from last week’s customer testimonial to the BK Electronics VTL kit, we thought we’d go into further detail about the evolution of the design. 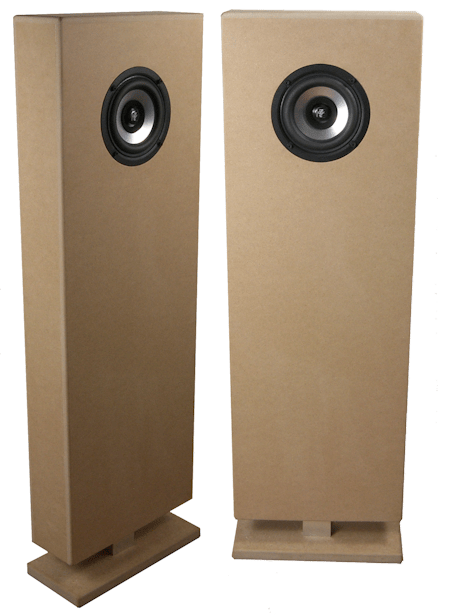 Ted Jordan designed the VTL loudspeaker enclosure in the early 1990s. It used the Jordan JX92S full-range drive unit and saw commercial success as the Konus Essence. It has enjoyed a long life among manufacturers and DIY constructors, and continues to do so with the arrival of the Jordan Eikona 2. The transmission line loudspeaker is an evolution of the acoustic labyrinth, first produced commercially by Stromberg Carlson in the 1930s. Arthur Bailey added a port in 1965 (Non-Resonant Loudspeaker Enclosure Design, Wireless World 1965) and a new enclosure species was born. The advantages of the transmission line over a reflex or sealed enclosure include more extended bass, better suppression of resonances and greater power handling. The basic idea is a speaker at one end of a pipe with a hole at the other. The pipe may be more or less heavily damped depending on design. The VTL is a type of transmission line known as a coupled cavity. The rear of the drive unit fires into a cavity which feeds into a long, damped pipe. Above a certain frequency, the cavity decouples the driver from the pipe and the enclosure behaves like an optimised sealed box. Robert Fris is generally credited with inventing the coupled cavity TL with his Daline (The Daline, A Decoupled Anti-resonant Line Loudspeaker, Hi-Fi News, November 1974), but in fact Ted Jordan described something similar four years earlier. Ted’s article for Wireless World (Loudspeaker Enclosures, January 1971) showed the evolution of the infinite baffle via the sealed box, reflex and horn to a box with long, damped line (see diagram below). 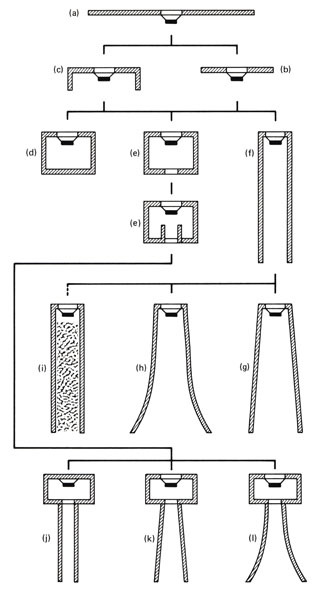 More recently, George Augspurger’s AES paper (Loudspeakers on Damped Pipes, JAES, vol 48 no. 5, 2000) on computer-modelled TL alignments concluded that the coupled cavity is a very successful option. The Eikona VTL remains as Ted envisaged it; a compact, floor-standing enclosure which is smaller and easier to accommodate than most transmission lines. The wide baffle goes against the modern trend of narrow-fronted enclosures, but it gives more weight and realism to the lower registers, particularly on piano and voice.